Ivy Grace Manning, spinster of the Parrish of Forest Gate, born a free woman in1920, was put into a nursing home at the age of 90, having lived at the same address for the whole of her life. The contents of Ivy’s home were gathered into a series of just ten cardboard boxes by a house clearance company and put into a yard auction 50 miles away, for people to pick over and bid on, this is how Ivy’s life ended. 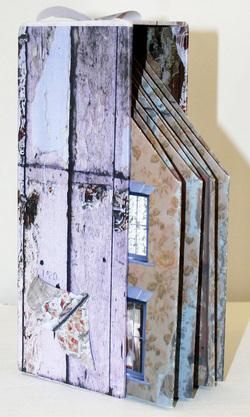 The book structure is in the form of a Victorian Terrace, the facade is an image of some vintage wallpaper boards that were salvaged from an old cottage. The boards were double sided, one side predominantly yellow, the other blue. I counted at least 12 different layers of wallpaper on the yellow side, some would have dated back to Victorian times. The windows of the middle terrace are laced with curtains - if you peep through them you can just see the bars of Ivy's cage. Sitting on a cold floor below the huge oak table, deep red cloth, fringe hanging over the edge. Ivy knows every part of the wood grain of the unpolished under surface. The faces in the knots. She often talks to her beloved grandfather whose gnarled brown face is just as she remembered. Ivy is looking down; her hands are busy sorting and sifting. An old silver tin stands with its lid off, contents displayed for Ivy’s inspection – her mothers button tin. Sitting one last time on the wooden chair, the table bare. Ivy is waiting for something. Her agitated fingers trace the wood grain on the table. The red cloth is neatly folded in a cardboard box. The curtains are down. Ivy can see a white van waiting outside. Boxes are being loaded. They have come for her. Sitting on a cold floor below the huge oak table, Ivy cries to her beloved grandfather whose gnarled brown face is still just as she remembered. The book is housed in a matching hard case, covered in the vintage wall paper and adorned with paper moths. Inside the slipcase shows the yellow side of the wallpaper.